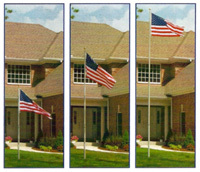 12''x18'' American w/ Spear, Falls Flag & Banner Co.
12''x18'' American w/ Spear on 30'' Staff. Cotton. Made in USA.